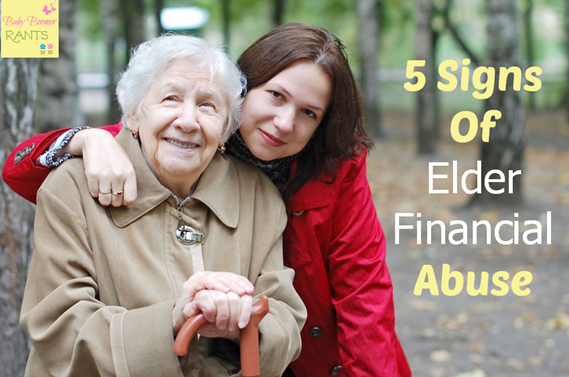 5 Signs Of Elder Financial Abuse! You are here: Home / Family Living / Parenting / 5 Signs Of Elder Financial Abuse! I am glad that my Mom is very cautious when dealing with her money. But, I know many Seniors are easily convinced to give their hard earned and saved money to someone or something that is only out to cheat them! So, today I wanted to bring you these 5 Signs Of Elder Financial Abuse. My Mom is very active on the internet, has a cell phone and a tablet. She can Facebook message, text, and use Pinterest and Amazon like a pro and she’s 88. I remember trying to ease her into this electronic world and she didn’t come easy. She was very cautious of her personal and financial information. But, every once in a while she will ask me a question about a story she received in her email and I realize she doesn’t always know whether it’s true or not. I am glad she asks me before acting, though. But, every day Seniors are “taken for a ride” by someone trying to steal their money. So, I thought this was a very timely subject, whether your parents are 65 or 88, it’s time to start keeping an eye on them to protect them from these leeches. Kai Stinchcombe wrote the following tips because of the troubles his own grandmother found herself in when bilked by numerous sweepstakes and other spending snafus that almost wiped out her nest egg. Money gone – This is the obvious one. If mom is a victim of elder financial abuse – whether it’s by a family member, a fraud ring, or a predatory marketing scheme – she’s going to have less money as a result. Keep an eye on her account balances – all of them, checking, card, savings, and investment – and watch for unexpected swings or steady drips. And if she says she can’t afford something, or if you notice that a card or check is getting declined, pay close attention! Is she having trouble paying for things that normally she could afford? Look for new phone call volume, changes in spending methods – checks vs ATM transactions, for example – late payment fees or notices, or changing behavior that might be signs of financial entrapment. New friends – All too often these senior entrapment schemes rely on the perception that the senior is susceptible, isolated, or even lonely. This is a tactic used by con artists, malicious caregivers, and predatory telemarketers and deceptive infomercial offers alike. “Just get the senior talking!” The more you build a trusting relationship, the more likely you are to get their money. If someone is suddenly spending a lot of time with mom or dad, get to know who the person is and what the nature of the relationship is, and it might be a good time to do a quick review of the account. Small clues in conversations – Sometimes if mom says something that doesn’t quite make sense, you just brush over it. She mentions her grandson’s trip to Mexico and you think to yourself “oh, she must mean Florida and got confused.” Maybe she’s talking about being entrapped by the grandparent scam, in which someone posing as a relative in a tough situation cons the elderly person into wiring money abroad. Also watch out for unusual gifts – family is often the most important thing to a senior, and so that’s often used as bait for financial entrapment. Merchants engaging in entrapment will often offer four for the price of one as part of a misleading sales pitch, and then the other three become gifts for family members. Or a sweepstakes or lottery winnings fraud will claim that a senior is going to get to take their family on an exciting trip abroad. Secrecy – Seniors suffering from financial entrapment often feel fear or shame about the situation they are in. If mom suddenly doesn’t want to talk about money anymore, that’s exactly the time when maybe you should be having a conversation about money. Other forms of abuse – Watch for signs of other forms of abuse – neglect, physical abuse, unnecessary medical care – as telltale signs that something isn’t right in the elderly person’s environment. In the end, the biggest thing is information. Make sure you have access to all the accounts and statements and are reviewing them periodically in a transparent, friendly way. As people age, they often need their family as a partner to help manage money – don’t wait until there is a problem to start building that partnership! And make sure you’re having a regular conversation with them and that you’re aware of any unusual behavior or changes in their surroundings.